As a sequel to the earlier Post on Master’s manifestation as Kalpataru in fulfilling the prayers of His devotees, I would like to narrate a few real life incidents here. Many of this Blog’s readers know that the Ramakrishna Centre in South Africa has 7 sub-centres and 8 Satsang groups. Some of my visits to certain Sub-centres have become routine: such as Chatsworth – every third Sunday for conducting Gospel class; Pietermaritzburg – every first Sunday for the same purpose. To Phoenix Sub-centre I generally go and address the Senior Citizens’ Forum, if not every month, at least more than 6 times a year. In my interaction with the devotees I am careful in learning how their spiritual life is strengthened and whether they did have any personal experience to narrate and so on. Its always inspiring to listen to such abiding and unforgetful experience even it be a dream, but ultimately the result is that the devotee stands to gain in making the nascent devotion steadfast to his/her chosen ideal. A poor old widowed lady approached us at one of our our Sub-Centres requesting assistance with groceries. Upon enquiring about her situation at home, she informed us that she lived alone. Her son lived with his family far from her home. They rarely visited her and seldom they see to her needs. She became depressed and lonely, until she began attending the programs at our Sub-Centre regularly. One day she felt very sad and unhappy. She felt unloved and uncared for. That night she dreamt of Sri Sarada Devi, who spoke to her in Hindi and asked her why she was depressed. The Holy Mother said that she was watching over her and she need not be afraid. The Mother said that she was providing groceries to her every month and mentioned the items by name, – dal, rice, sugar etc – and all her needs were being taken care of, so why must she still worry? The old lady got up startled and felt very peaceful. When we started assisting her with groceries, she felt greatly blessed to have seen and heard the Holy Mother in her dream and she knew for certain her prayers were being heard. Within a short time she developed a deep and abiding faith in fulfilling power of our Holy Trio. Another old widowed lady, who lives alone, had been informed that she would have to pay a few thousand Rands to have the title deed of her house transferred over to her name. She could not afford this amount and prayed to our Master to help her out of this situation. Within a short time she received a notification that this amount had been waived and the house was transferred onto her name. She became emotional after realizing it was through the grace of the Master as a consequent to her intense prayer that her problem had been resolved. A frail looking old man who comes to our Sub-Centre regularly, once came with a bandage wrapped around his head. Upon enquiring if he had got hurt, he replied in the affirmative and said he had slipped in the bath-tub and fell, hitting his head. He remembered calling out to Mother Sarada and said it was indeed a miracle that he had not sustained any concussion or broken bones, and the strangest thing was that there was hardly any bleeding. He knew that Mother had protected him. While ruminating over these faith-bearing incidents, I was reminded of another interesting incident that happened when I was in Ranchi Sanatorium. A devotee couple P & G used to come to the Ashrama regularly. One day the lady P was found very sad. Naturally I enquired what was the matter that made her so sad. She said that she was staying in the upper storey of the building and every day morning, on getting up from bed, she would look out through the windows and would be glad to see the freshly blossomed flowers. The sadness is due her inability to offer any of these beautiful flowers at the feet of the Master’s photo. I asked why she could not collect flowers from down below. She replied that she could not because that the garden was maintained by the ground floor police officer’s wife and she was for obvious reasons reluctant to ask favour from her knowing how that lady was not social. Lo! that was terrible for her! I consoled her saying that whenever she sits for her doing sadhana she should pray to Master that He may bless her by providing opportunity to do offering of flowers. Well, I didn’t know whether to weep or laugh! strange are the ways of Almighty! Inscrutable is His maya!! We regularly pray to God. But sometimes we feel that we get lot of sorrows than peace and happiness. After working very hard with sincerity we do not get the result we think of. Trust that all are keeping well at your end. Sri Ramakrishna taught to bear and forbear. Thakur used to say “He who bears, endures forever, he who does not bear is lost.” Patience and forbearance is very important to overcome difficulties. He is indeed an ocean of mercy; He will protect you under all circumstances. have to trust Him and, eventually, they will all make something wonderful! Whenever you want to talk, He’ll listen. This was a brilliant article! I thoroughly enjoyed the interesting anecdotes. Mahatma Gandhi was truly the dynamo of the Prayer power! His struggle in South Africa is deeply appreciated by one and all here. We, as South Africans, are proud that Gandhiji’s famous ‘satyagraha‘ originated from this country. Thanks for a most timely post! Happy you enjoyed the article. Always take refuge in the Lord and under all circumstances keep recollectednes of Him. Yes, in this country Gandhiji is very well remembered. His ‘Prayer Power’ was incredibly potent. My humble pranam to you. I trust, that with Master’s grace you are blissfully well. 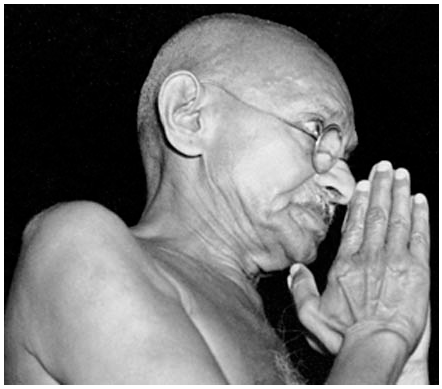 Thank you for your blog on Gandhiji’s legacy, highlighting the Power of Prayer. I also thoroughly enjoyed your narration of all the devotees’ plights and how Master and the Holy Mother came to their rescue and reinforced their faith. The pictures of the flowers in Ranchi are divinely beautiful and definitely other-worldly. Many thanks for your warm hospitality whenever I am at PMB. Happy you enjoyed the article too. He who keeps his mind on God, finds His grace, and through His grace, finds holy association, his mind becomes purified and he becomes endowed with right understanding. Always think that you are the servant of the Lord and as you proceed with this conviction, you will find continued joy and peace as freshly blossomed flowers in your life. May our Holy Trio guide you in your quest for God Realization. Firstly, Swamiji I sincerely thank you from the core of my heart for your favour in sending such elevating mails. Secondly, I am trying to recollect the prayer Holy Mother put before Sri Sri Thakur that her children should never be deprived of coarse cloth and meals, which Sri Sri Thakur promised. Thirdly, as regards the very life of Mahatma Gandhi, I feel that he was a saint. Trust that all are keeping well. It is only by the Grace of Thakur, Ma and Swamijee that these posts give devotees inspiration. Yes, our great Mahatma Gandhi stood for truth and non-violence and above all his large-heartedness for the masses of poor made him a saint. How many are there who can hold lofty ideals and live exemplary lives? Man achieves greatness, large heartedness and guilelessness by tapasya of many births and only through the grace of God. La Gracia de Dios siempre está soplando!! Gandhiji, I believe, exemplified that. In that sense, he was a true follower of the Upanishads and Swamiji. I read about unprecedented winter in Ranchi this time. Trust that you are all keeping well. Yes, Gandhiji‘s life was a stellar example! My humble prostrations to Holy Trio, and revered Maharaj. I pray that you are well Maharaj. I really like the topic you have chosen. On many occassions in the Gospel Master has procliamed prayer to be a sure way to God. Indeed even in the most difficult situations God listens to you. Master says that God can even hear the foot fall of an ant. Therefore we should not be afraid to pray and call on him in any place and any time. Its such a marvell as to how the Lord will respond in the most unique way and at the precise time. Will a mother or father ever leave a child in distress! I think not. Thank you for your comment and warm sentiments. Those that take the name of Sri Ramakrishna become world movers! They are aware that the divine force is behind them at every step. The ideas of Sri Ramakrishna is being spread internationally bringing a flood of bliss and peace. Whenever any good work is done in the spirit of seva to Sri Ramakrishna, without expecting any result whatsoever, his power and divine light will be given to us. Pranam at the lotus feet of Sri Pujya Swamiji! How true! Yes, I remember the spiritual instructions given to an ardent devotee of our Ashram whom wanted her child leave bad company and drugs, and reform into a responsible teenager. She continuosly admonished and scolded the child which only worstened the situation. The mother was Advised to offer the problems at the feet of Sri Gurudev, and instead of scolding the child, chant ‘Ram Naam’ focusing on how she wanted him to transform. Amazingly there was drastic change. The child took to Satsangh and deserted bad company! I also feel a change in my home atmosphere when I am sluggish with my Sadhana. How much brighter everything is when Gurudev is ever shining in our hearts! Trust that you all are keeping well. Thank you for appreciating this article! Holding the feet of Gurudev, regarding Gurudev as Lord Hari, serve His children. Know for sure that His grace is on you. God is antaryaami, the inner ruler, He sees and knows everything. Taking refuge in Him, and at the same time solely dependent on Him, engage in your sadhana. With His bounteous grace your life will be blessed. My Pranam and prostrations at thy feet! I humbly thank Swamiji and all the Gurus of the Ramakrishna Movement, past and present, who have taught us the true strength of prayer and the hope it provides, else the lives of many individuals, including myself, would have remained in complete darkness. Thank you for this most informative blog! Yes… Salutations to all our Gurus who have left behind a shining legacy for all to follow! Be absorbed in thought of Sri Ramakrishna and Swamiji, try and imbibe Their spirit, such is my heart’s desire for you and all the youth of the world. Always cultivate pure thoughts. Purity is strength, and Purity is God. Read the teachings of Master, Mother and Swamijee regularly. It is good to discuss their teachings with your friends. We were very impressed at your sober behaviour when you stayed in the ashram a few days. Whenever you get such leave collect a few youth and spend some time at the ashrama. Wonderful incidents of FAITH in the Lord and the POWER of His care for the poor and needy! Yes, Sri Thakur reaches every one who looks up to Him for help. What is needed is faith in His Power! In a pure body and mind the power of God becomes manifest. So true when one’s mind is soaked in Lord, the impurities of the mind will be washed away. Always have the firm conviction that when Sri Ramakrishna’s Name is taken with love, one will be free in this life itself. May Thakur, Ma Swamijee bless all of us abundantly. As always the post is beautiful and inspirational. I remember a long time ago requesting Revered Maharaj for some more personal experiences of devotees, and so feel greatly heartened and inspired to read them. Often in difficult times one thinks, as the famous author James Joyce expressed it, that God is sitting in a far away heaven paring his fingernails. In other words, utterly indifferent. These experiences re-energise our faith and strengthen the bond between devotee and Deity. May Sri Ramakrishna and Sri Ma bless all the visitors of this blog that we may adopt this practice in our lives with all sincerity. Revered Maharaj! thank you so much for keeping this torch burning! Heartfelt thanks! Yes, truly your long time request was hibernating in my mind. In maintaining a blog, it is said that one gets lots of ideas from the readers’ comments and they serve the usefulness of breaking the writer’s block! The beautiful message you have quoted is very true and inspiring. We are all born to serve all “jivas” as Narayana. This is our sadhana. We have to make the whole world our very own. Without love and steadfastness nobody can progress in spiritual life, nor can they do good in this world. Our prayer is for all mankind. May there be hope, peace, spiritual and material prosperity for all is my ardent prayer! The five pithy lines are from Vilvamangal‘s Govind Damodar stotram?! Well, I never knew it!! I have collected that stotram from Internet and I shall love to go through it. Thank you for your beautiful reply to my comment. The quote is not exactly from the stotram. I discovered it while searching for another one. What I meant to say was that the poet saint Vilwamangala expresses an idea similar to the quote. This same stotra has been sung beautifully by Pandit Jasraj and by Sri Ravindra Sathe. If Revered Maharaj so wishes, I could offer the same. To listen to them is indeed a transformative experience. Yes, I would love to listen to both the artistes! In 2010 Pt Jasraj was here for a performance and I was one of the huge audience enjoying his lovely music to my heart’s content! The organisers kindly took me to him in the backstage and I met Anindyo (Tabla player) also there. It was a nice, happy meeting when he with soulful emotion was narrating the grace he received from revered Ranganathanandaji Maharaj at Hyderabad ashram. It is true that God comes in any form and answers to real bakthas. After reading those prayers, I do not know how to comment. I had good feeling through out the day. They all are very lucky to get that experience. This is your first response in my blog, and I am happy about that. Yes, it is true… Any experience that go to stabilise our faith in God is always inspirational. Whenever dharma declines God appears in many names and forms to teach His children their true divine nature thus re-establishing Dharma again. Have intense faith in Him, and you will be blessed by His Grace alone. Your heart will always be filled with love. and in turn you will give love to all His children and creatures. With God’s power all is possible! May our gracious Lord shower you with bhakti! How are you? It was wonderful to read the beautiful article by you. God is always with us. We should have trust on Him. He always makes ways to solve our problems. You are very lucky to have so many bhaktas in your life. My heartiest pranam to you. Hope Mani and all others in the family are keeping well. It was so nice of you to send a comment. Yes, one should always have faith and devotion to the Lord. When one calls the Lord with deep yearning, He hears and sees inside us. Indeed, as Master says, company of bhaktas is an antidote to the poison of worldly attachment. I draw inspiration from every bhakta who has surrendered to God and dependent on Him only. Thank you very much for sharing such inspirational incidents. It reminded me of the lines ‘adyapih leelaa koren Goraa Raai, Kono kono bhaagyobaane dekhibaare paai’. I think with the blessing of Holy trio you are well. Prayer is the way of God. He always solves our problem but we can’t understand His way. How can I fixed my mind on Him? Maharaj Subha Nobo borsher pranam grahan korun! Anek derite tomar shubho nobo borsher preeti, bhalobasha janai. Sorry for the delay in my reply. I was awfully busy with the visit of brother Atmapriyananda here. He left on 14th instant after spending a ‘navaratri’ joyfully here. You want to know how to fix your mind on God. Perhaps in Sri Sri Ramakrishna kathamrita you have come across this very question put by ‘M’ to Master. Here is His reply. “Repeat God’s name and sing His glories and keep holy company; and now and then visit God’s devotees and holy men. The mind can not dwell on God if it is immersed day and night in worldliness, in worldly duties and responsibilities; it is most necessary to go into solitude now and then and think of God. To fix the mind on God is very difficult, in the beginning, unless one practices meditation in solitude. When a tree is young it should be fenced all around; otherwise it may be destroyed by cattle. Start your sadhana. It is never late, mind you!